In early March we went beyond the 14 mark for the first time since November 2016, by averaging higher than 14 thousand km³ sea ice volume. Now the worm has turned and we’ve been going down for a few weeks for the first time in 5 months, but of course, as soon as such a thing is published, the Arctic will twist and turn like the giant unpredictable Midgardsorm it is, or at least the pendulum will likely go back and forth a few times, before we truly know where we’re heading. Q: How can anyone make an annual average graph? A: Easy. Use a computer. Add all the ice for the latest 365 days, divide by that number of days. In mid April we went back below the 10 mark, by averaging lower than 10 million km² sea ice extent. The worm has turned, and explicitly suggested in a dotted way below, is the possibility of 2nd lowest or a new record low for the full calendar year. Arctic sea ice extent has also been lowest on record for the date for 25 consecutive days. Arctic sea ice volume meltdown has come 0% of the way from Winter Maximum to a Blue Ocean Event per April 22nd. The lowest volume year ever, 2017, by the same date, was also at 0%. Q: How can anyone know if there is a Blue Ocean Event? A: Easy. Use a computer. If you have less than 1000 km³ sea ice volume in the Arctic, then you have a Blue Ocean Event. A: Let’s say you want to know when the Arctic Ocean goes ice–free. Basing this on satellite measurements instead of gut feeling makes your conversations more interesting. The brilliant Dave Borlace and his «Just Have a Think» YouTube channel made this 4–part series. This is part of the reason the kids are rebelling. Also by Mr Borlace. Arctic sea ice extent meltdown has come 13% of the way from Winter Maximum to a Blue Ocean Event per April 21st. The lowest extent year ever, 2016, by the same date, was at 9%. A: Easy. Use a computer. If you have less than 1 million km² sea ice extent in the Arctic, then you have a Blue Ocean Event. Good Hope Model April 20: Our first ½ year long Arctic Blue Ocean Event could come as early as 2023. No sea ice for 6 months, in as little as 4 years? The Good Hope Model, explained further in the YouTube below, has recently gone through quality control updates & control calculations (which you should ALWAYS do to check that your math is right). Instead of trying to build a huge model of the entire planet inside a computer, the Good Hope Model applies 40 years of already registered ice data, or what has already happened, and looks at how rapidly we have been losing ice. Different long & short averages of this decline provide different estimates for the disappearance of Arctic sea ice for 6 consecutive months. 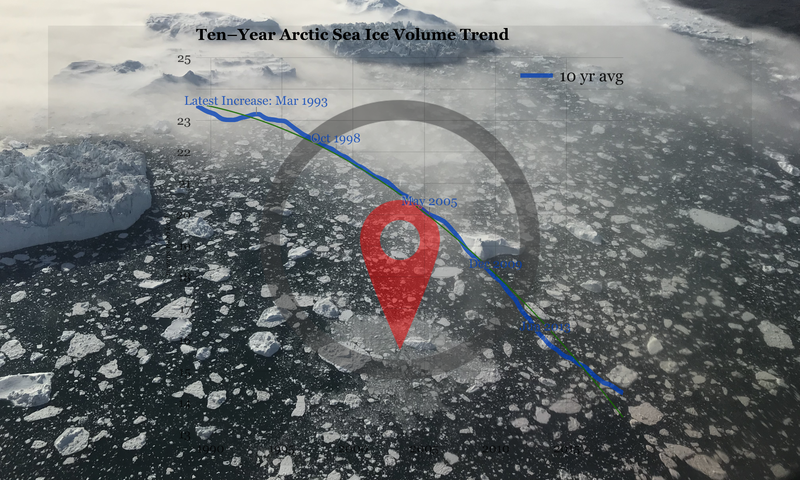 The Year–To–Date average volume went from 7th in March to 5th lowest for sea ice on Thursday, after some record early flash melting this year. Now the Top 3 lowest for the year is within reach! The Year–To–Date average extent went from 6th to 4th lowest for sea ice in the Arctic on Thursday, after the YTD graph peaked record early this year. Now the 4 lowest years are also the 4 most recent years.